There are many things to love about a Farmer’s Market– an excuse to wake up early on a Saturday and indulge in a freshly made breakfast, the opportunity to eat locally and seasonally, the chance to taste fruits and vegetables that are as fresh as they can be. For me the best part might be talking with the farmers, getting to hear how things are grown, joking with them about the best ways to prepare certain foods, gaining insight into the food philosophy of the people growing my fruits and vegetables. It’s an empowering experience, something that brings you much closer to your food than standing in a grocery store aisle. Recently I met my friend Heather at the Columbus County Community Farmer’s Market, a permanent open-air market in Columbus County, NC. Columbus County is a rural county located in Southeastern North Carolina, about an hour’s drive from Wilmington. 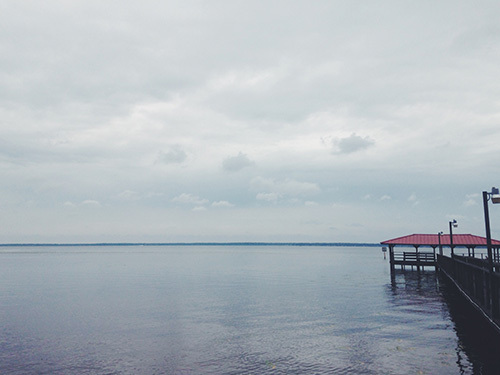 In the two years that we’ve been here I’ve traveled to Columbus County a few times to visit Lake Waccamaw, a beautiful fresh water lake surrounded by campgrounds and a small community. When I started researching the area for this series, I stumbled across the farmer’s market, which was established in 1998 and has been funded by the Rural Advancement Foundation International and the North Carolina Tobacco Trustfund Commission. The farmer’s market is housed in a permanent open air structure and boasts space for up to 20 local vendors. Strolling through the market on a late Spring Saturday reminded me of all those midwinter days when I found my thoughts drifting to warm summer mornings, fresh fruits, crisp vegetables, air thick with humidity. The drive combined with my total inability to wake up early (ever) meant I arrived at the market midmorning after the early riser rush. I may have missed out on some of the vegetables but the trade off was well worth it- the farmers were free to chat. One of the things I was surprised by was how many of the farmers we met were excitedly offering organic heirloom vegetables. At almost every stand we had a conversation with the farmers about the sometimes underappreciated beauty of mis-shapen heirloom vegetables, why it’s best to avoid using Sure-Jell in your jams, and how a solution of vinegar and soap can keep the pests away. One farmer that we spoke with for a while who was the essence of charm, was John of Higher Ground Organic Gardens. He had a beautiful crop of potatoes, beets, carrots, kolrabi, beans, squash, and (much to Heather’s delight) rhubarb. John was sweet and kind, answering our questions and telling us about how things are growing this year. 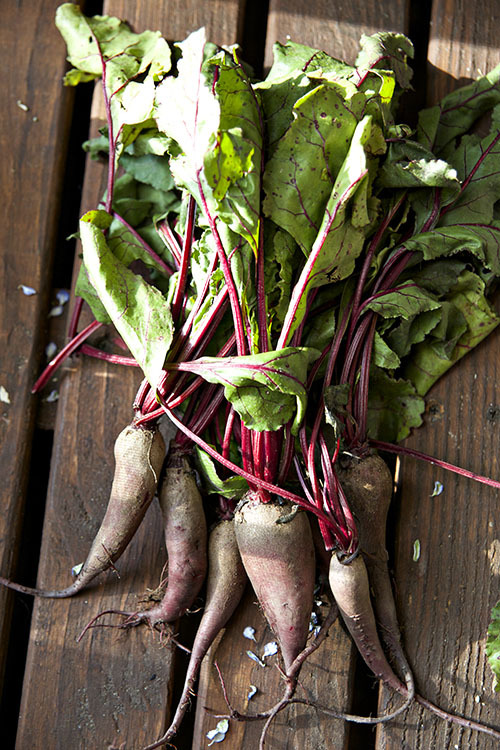 I walked away from the market with fingerling beets, beet greens, green beans, and patty pan squash. Heather came down from Raleigh for the weekend to talk blogging and work on her practicum project. She is a finishing up her graduate work at Meredith and has decided to work with me for her practicum project, helping me research three counties for the Tasting North Carolina series– Wake, Forsyth, and Lenoir. I thought visiting an additional county on my list, Columbus, would be a good way to kick off the weekend, so after meeting at the farmer’s market we headed down to Lake Waccamaw for lunch at Dale’s Seafood. When I was researching things to visit and see in Columbus Co. I found an article from Our State that does a much better job of explaining the history of the lake than I ever could, particularly the theories concerning how it was formed and the life teeming in the water. Dale’s sits on the shores of the lake, overlooking its 9,000 acres. We sat and took in good old fashioned Southern meat and three fare- I had a deviled crab, fried okra, and hush puppies and Heather enjoyed the steamed shrimp platter- and watched the lake, which is serene and breathtaking in its expanse. Columbus County is surrounded by Bladen, Pender, and Robeson counties to the North and Horry and Brunswick counties to the South. 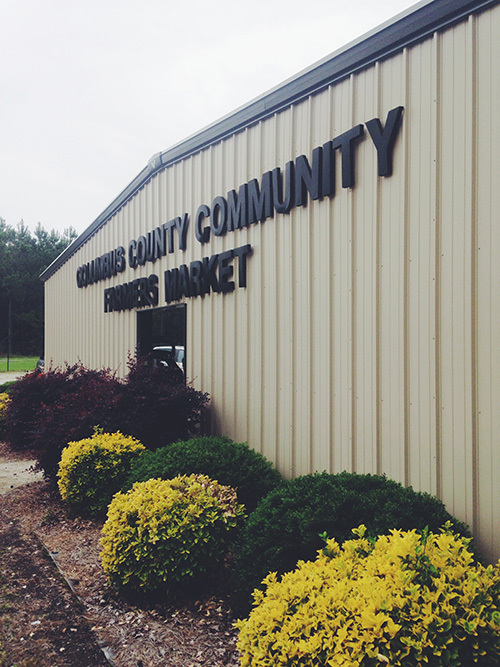 Its county seat, Whiteville, is where you’ll find the Columbus County Community Farmer’s Market, as well as the community that it serves. 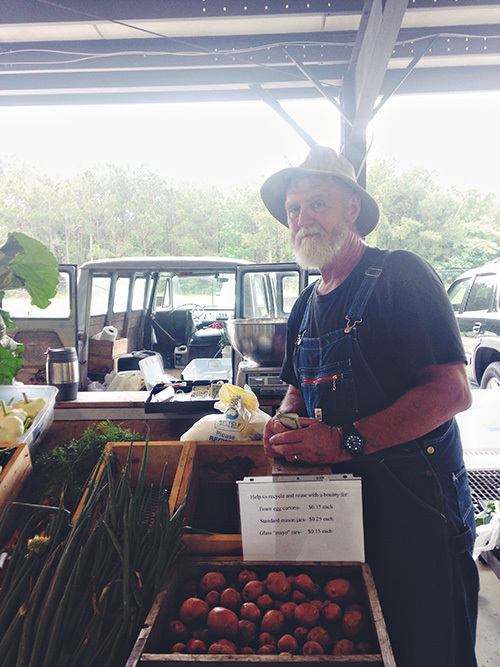 The next time you’re driving down to the beach stop by for some fresh vegetables, good company, and a glimpse of one of the Carolina Bays. Whisk together olive oil, yeast, salt, basil, and water. Whisk until fully incorporated, at least 2 minutes. Add half of the flour and stir with a wooden spoon. 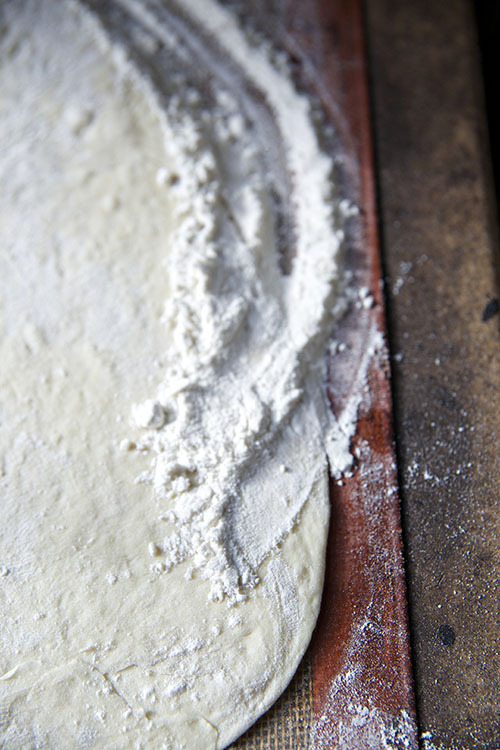 Add remaining flour and knead for ten minutes, until the dough feels like a stress ball. Coat a glass bowl with olive oil. Place the dough ball in the bowl, turn once, and cover with a damp towel. Let rise for at least an hour. Punch down and let rise another 15 minutes. 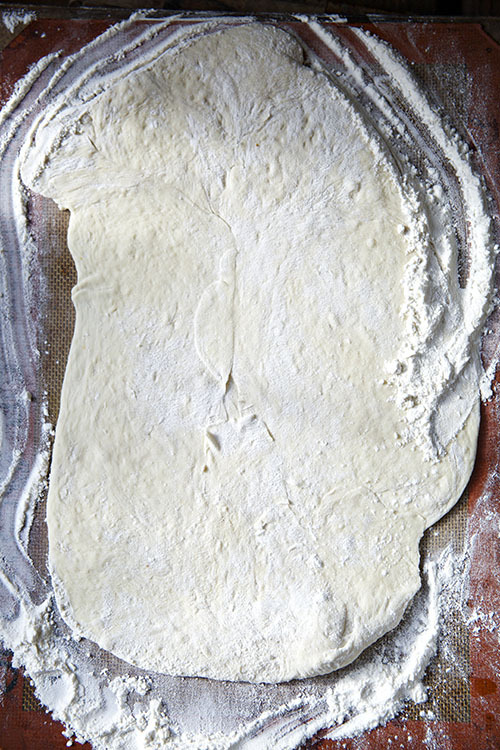 Roll out your dough and heat your oven to 500 (or as high as it goes). 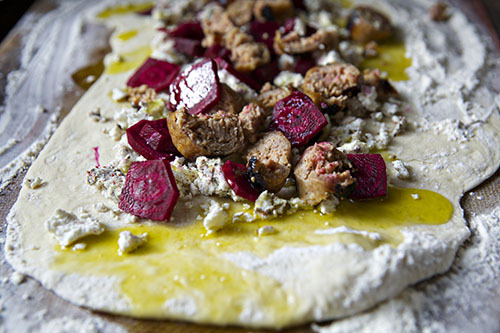 Spread goat cheese evenly across the dough (as best you can), then follow with beets and sausage. Drizzle with olive oil and sprinkle with salt. Bake 12-15 minutes or until golden brown. Top with fresh greens and serve hot. What a marvelous day this was! 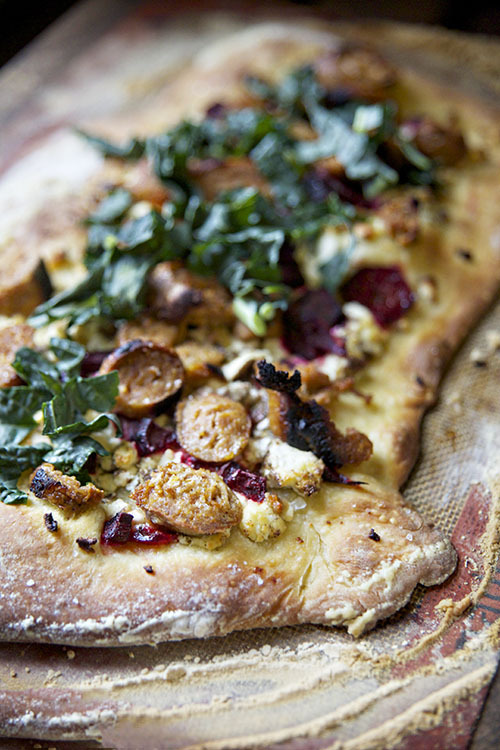 I love how the beets bring such color to the pizza. 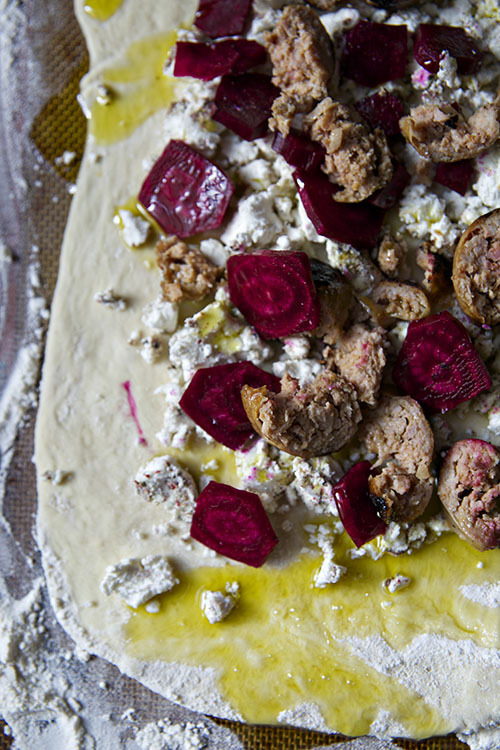 I’m sure the combination of beets, goat cheese and sausage is one to remember. I will be sure to try this! I don’t use Sure Gel, but out of curosity, what is the issue with it? Hey Heather! The farmer I was talking to said she doesn’t use Sure-Jell because she prefers to make her jams organically, GMO-free, and without additives. She relies on the natural pectins in the fruit.